There has been dramatic growth throughout the United States in the numbers and use of unmanned aircraft during recent years. “Unmanned aircraft” is defined as a device that is used or intended to be used for flight in the air without the possibility of direct human intervention from within or on the device. This term includes all types of devices that meet this definition (e.g., model airplanes, quadcopters, drones) that are used for any purpose, including for recreation or commerce. In some cases, their use has resulted in noise and nuisance complaints from park visitors, park visitor safety concerns, and one documented incident in which park wildlife were harassed. Small drones have crashed in geysers in Yellowstone National Park, attempted to land on the features of Mount Rushmore National Memorial, been lost over the edge of the Grand Canyon, and been stopped from flying in Prohibited Airspace over the Mall in Washington DC. Policy Memorandum 14-05, released by the National Park Service (NPS) director in June 2014, directed each superintendent to use the authority under 36 CFR 1.5 to prohibit the launching, landing, or operation of unmanned aircraft, subject to the certain conditions and exceptions set forth in the memo. This is still in force with a very few exceptions. This action applies to the launching, landing, and operation of unmanned aircraft on lands and waters administered by the NPS. Jurisdiction by the NPS ends at the park boundary. The policy memorandum does not modify any requirement imposed by the Federal Aviation Administration (FAA) on the use or operation of unmanned aircraft in the National Airspace System. Why did the NPS restrict unmanned aircraft? The National Park Service embraces many activities in national parks because they enhance visitor experiences with the iconic natural, historic and cultural landscapes in our care. 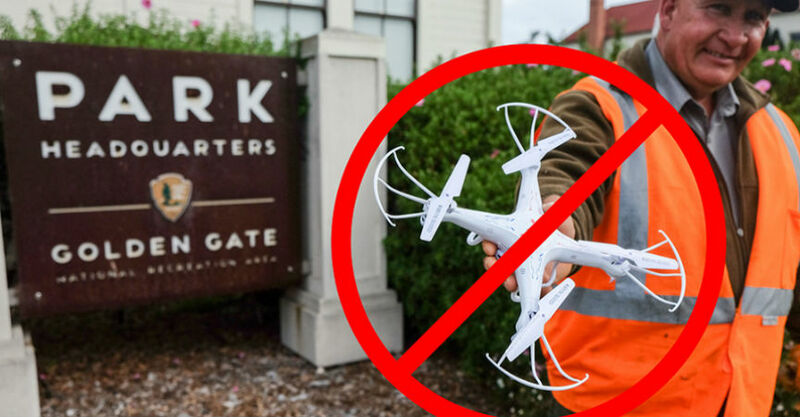 However, due to serious concerns about the negative impact that flying unmanned aircraft can have for safety of visitors, staff, and wildlife, they have been restricted in all but a few parks. If I am flying my unmanned aircraft in the national airspace and do not take off, land, or operate from NPS lands and waters, is there anything the park could do to stop me? Unless an unmanned aircraft pilot obtains special permission through the FAA, use of unmanned aircraft must remain line of sight. In addition, although they do not directly address unmanned aircraft, the following existing 36 CFR sections may apply under certain circumstances. If the unmanned aircraft pursuits or harasses wildlife or creates an intentional disturbance of wildlife nesting, breeding, or other activities, the user could be cited for a violation of 36 C.F.R. § 2.2. If the user of the unmanned aircraft knowingly or recklessly creates a risk of public alarm or nuisance by causing noise that was unreasonable under the circumstances or by creating a hazardous or physically offensive condition, the user could be cited for disorderly conduct under 36 C.F.R. § 2.34. 36 C.F.R. § 2.12(a)(3) prohibits, in non-developed areas, operating a device powered by a portable motor or engine, except pursuant to the terms and conditions of a permit. Can I launch and land my unmanned aircraft outside the park boundary? The NPS has no authority outside park boundaries; the unmanned aircraft operator would have to get the permission of the landowner. I would like to fly my small unmanned aircraft in a park for recreation. Are there any options available? Check the park website to see if it is an allowed activity at the park. If not, check with the park superintendent to see if an area can be designated within the park, and/or a special use permit can be obtained. How do you enforce the prohibition on unmanned aircraft? Park rangers enforce the prohibition, they have discretion to look at potential violations on a case-by-case basis. Is violation of the prohibition on unmanned aircraft a felony? Misdemeanor? Violation of the ban is a misdemeanor with the maximum penalty of six months in jail and a $5,000 fine. Does the National Park Service use unmanned aircraft? The National Park Service uses unmanned aircraft for administrative purposes when appropriate and approved by the director of the region in which the park is located. These purposes may include search and rescue operations, fire operations, scientific study, and aerial photography. How are other land management agencies handling unmanned aircraft? We cannot speak to policies, rules and regulations that affect unmanned aircraft use at other federal agencies and recommend you contact those agencies directly. Links to other agency websites may be found at https://www.nifc.gov/drones/.